I’ve scientifically determined the date the world will end. It’s the day that I run out of titles on my to-watch pile. Somehow, that pile never seems to shrink, and days like Black Friday help keep it topped up like the never-ending sausage (Perishers reference). Yuru Yuri Season 1 is the latest title to come off the top of the pile, and it’s one of the most delightful slice-of-life comedies that we are unlikely to see in the UK. It’s a school comedy, with an after school club devoted to doing nothing, and a cast of girls and a whole heap of unrequited love. It’s wacky and it’s surreal, and it always makes me laugh. Then came the delightful surprise that is Grimoire of Zero. I wasn’t expecting much from a fantasy anime, but the quality of the story, and especially the characters made this show stand out above its peers. A world where magic has been introduced is going off the rails, and the girl inadvertently responsible ventures into the wider world for the first time, seeking the Grimoire that bears her name, that is responsible for it all. She runs into a gruff mercenary who has built a career on hunting witches just like her, but somehow Zero and this Mercenary form a strong bond. One of the better fantasy titles is worth a look. Click on the review to read more. My final review of the week was for the Fireworks feature film, a studio SHAFT production directed by Mr Monogatari himself, Akiyuki Simbo. This one is a romantic coming of age tale with a bit of a sci-fi twist. A girl wants to go on a date with a boy, but the boy and his friends have a more pressing question to answer, whether fireworks explode in three dimensions or just two. Fireworks promised much, but the end result was more of a damp squib than epic display. School Rumble Season 2. Compulsion plus completion has put a strain on many a wallet, especially my own. Revelation films released the first half of the first season of School Rumble on DVD, leaving me having to import the final three volumes from the US. Once I’d seen that, I simply had to have the second season as well. It’s lucky that the ‘third’ season was never released in the West. Actually we all dodged a bullet there, as I other-meansed it when my curiosity was too much, and it was an ending unworthy of the series. The love triangle between ditzy Tenma, delinquent Harima, and space cadet Karasuma continues to rumble in the second season, and things get more and more complicated as more characters are added into the mix. The second season is a little more variable than the first. At its best it’s funnier, but it does fall flat on more occasions. It all averages out the same though. It’s an import again. 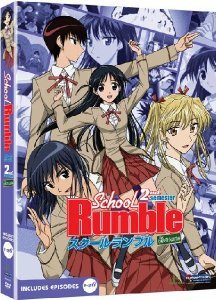 Funimation released School Rumble Season 2 in two halves in 2008, and the following year it was released as a four disc complete series collection. Here’s my review of the latter. Today you can import it on Funimation’s S.A.V.E. budget label. 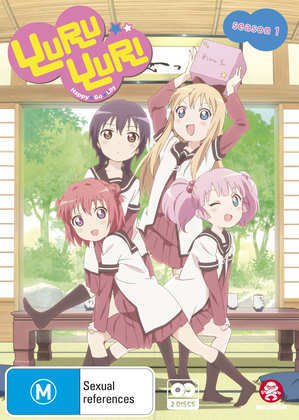 Madman Entertainment released Yuru Yuri Season 1 on Region 4 DVD in 2015. If you can’t find it, you may be able to find NISA’s Region A Blu-ray of the same. 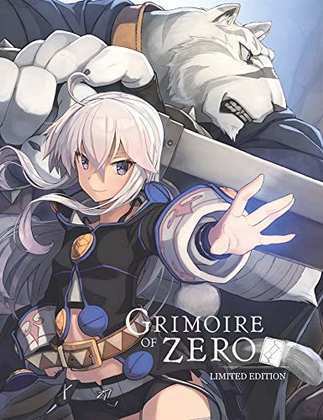 MVM released Grimoire of Zero as a BD/DVD combo release on the 12th November. Standard editions will be out in 2019. 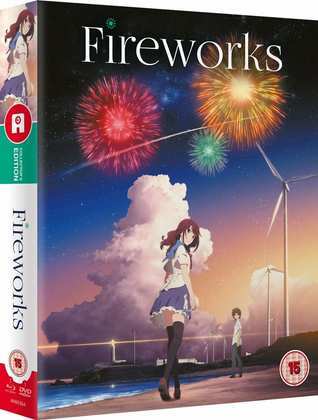 All the Anime release Fireworks as a BD/DVD Collector’s Edition and standard DVD and BD today.